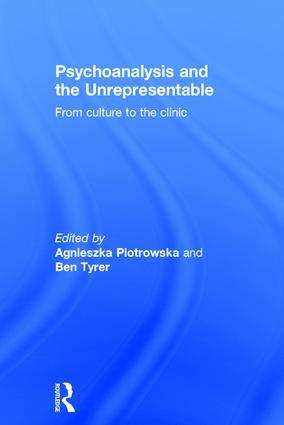 Psychoanalysis and the Unrepresentable opens a space for meaningful debate about translating psychoanalytic concepts from the work of clinicians to that of academics and back again. Focusing on the idea of the unrepresentable, this collection of essays by psychoanalysts, psychotherapists, counsellors, artists and film and literary scholars attempts to think through those things that are impossible to be thought through completely. Offering a unique insight into areas like trauma studies, where it is difficult – if not impossible – to express one’s feelings, the collection draws from psychoanalysis in its broadest sense and acts as a gesture against the fixed and the frozen. Psychoanalysis and the Unrepresentable is presented in six parts: Approaching Trauma, Sense and Gesture, Impossible Poetics, Without Words, Wounds and Suture and Auto/Fiction. The chapters therein address topics including touch and speech, adoption, the other and grief, and examine films including Gus Van Sant’s Milk and Michael Haneke’s Amour. As a whole, the book brings to the fore those things which are difficult to speak about, but which must be spoken about. The discussion in this book will be key reading for psychoanalysts, including those in training, psychotherapists and psychotherapeutically-engaged scholars, academics and students of culture studies, psychosocial studies, applied philosophy and film studies, filmmakers and artists. Agnieszka Piotrowska,PhD, is an acclaimed filmmaker and theorist. Her current work focuses on post-colonial relationships in Zimbabwe. She is the author of Psychoanalysis and Ethics in Documentary Film; Black and White: Cinema, politics and the arts in Zimbabwe and the editor of Embodied Encounters: New approaches to psychoanalysis and cinema (all Routledge). She is a Reader in Film at the University of Bedfordshire. Ben Tyrer teaches Film Studies at King’s College London. He has published widely on psychoanalysis and cinema. Piotrowska and Tyrer together run Psychoanalysis in Our Time, an international research network funded by the Nordic Summer University.